Mickey’s Very Merry Christmas Party begins tomorrow night, November 7, 2016 and runs into late December. Disney has provided a look at the merchandise that will be exclusive to the parties. Disney – A new limited edition retail MagicBand was created for the event. 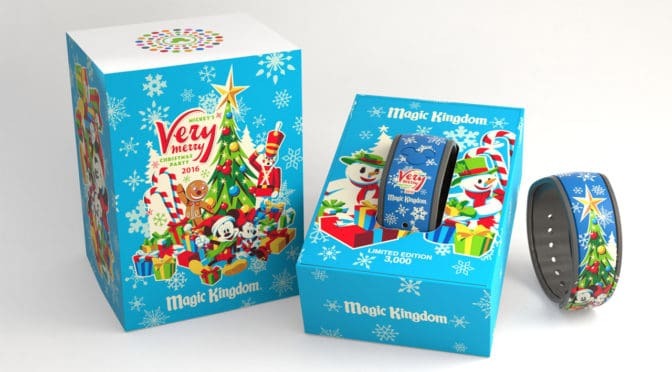 This MagicBand will have an edition size of 3,000 and will be presented in a decorative box. 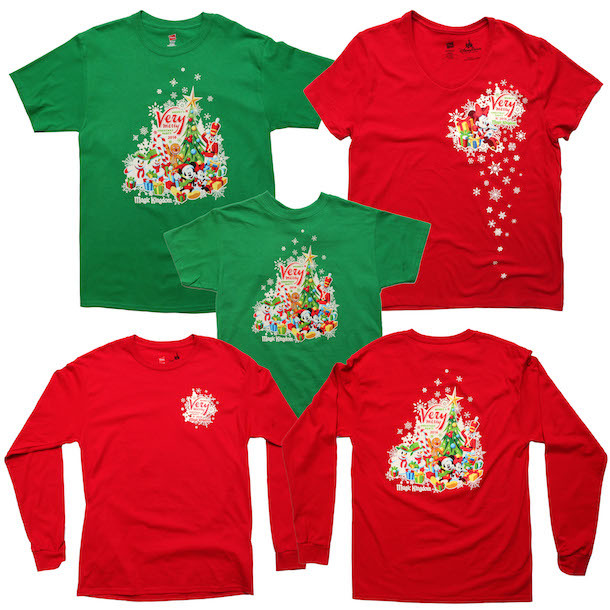 Guests will also find short and long-sleeved apparel for both adults and kids. Annual Passholders will find a special t-shirt designed just for them. This shirt contains the overall event logo on the back of the shirt with “Passholder” printed on the sleeve. 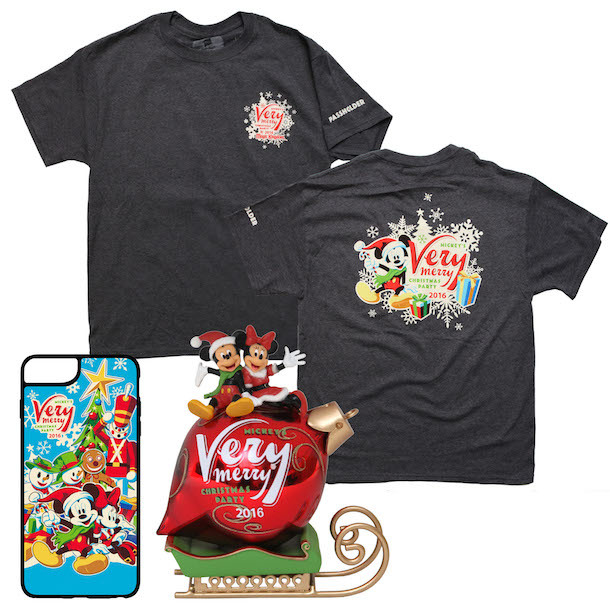 Other commemorative products include a holiday ornament featuring Mickey and Minnie Mouse, and a new D-Tech on Demand case available for select mobile devices in the Tomorrowland Light & Power Co.
A limited release logo pin will be found at several locations throughout the park. We will also release a limited edition pin only available to Annual Passholders. This pin will have an edition size of 3,000. 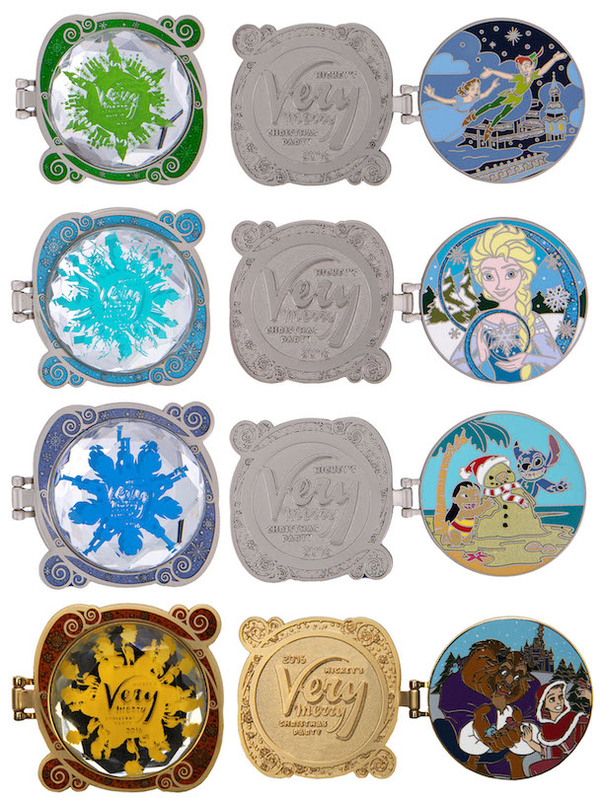 This year’s limited edition pin collection includes hinged pins that open to reveal classic Disney characters including Lilo and Stitch or Beast and Belle. Each pin will have an edition size of 5,300. 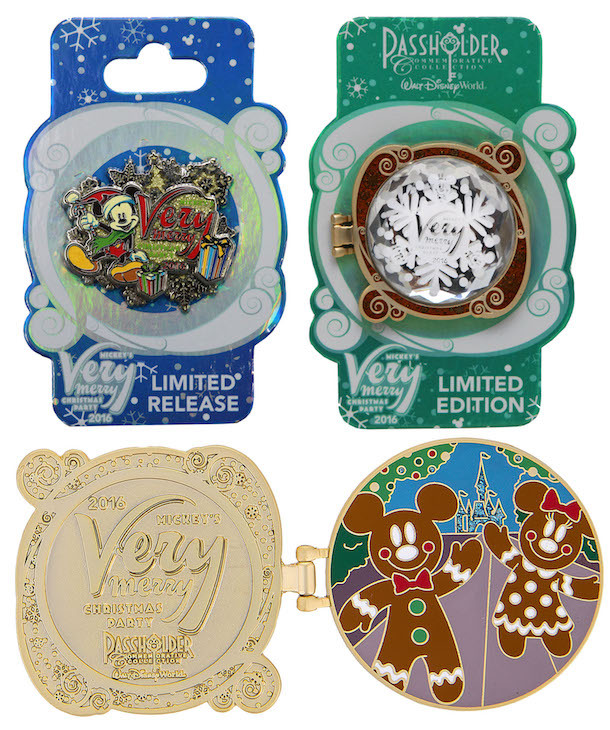 The jumbo-sized, limited edition pin featuring Mickey Mouse, Minnie Mouse, and Pluto enjoying as sleigh ride will have an edition size of 1,000. The box set (edition size 1,000) contains the individual limited edition pins and a special completer pin with WALL-E and Eve. 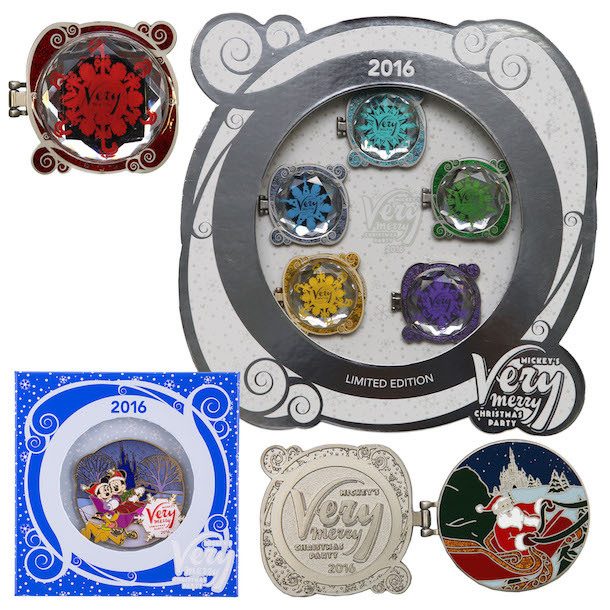 The framed pin set (edition size 300) will contain all the individual limited edition pins, the boxed set completer pin, and another completer pin featuring Santa Claus. Here are the best places to find these items at Magic Kingdom Park during the party. Please note that all items will be available while supplies last. Tomorrowland – Mickey’s Star Traders (apparel and logo pin) and Tomorrowland Light & Power Co. (D-Tech on Demand case)Mickey’s Very Merry Christmas Party is held on select nights, November 7 – December 22, and is separate from regular Magic Kingdom Park admission. Tickets are available now on DisneyWorld.com. Can you buy the magic bands ahead of time? If you already have purchased a magic band will they transfer all you fast passes and tickets? They will add your MagicBand to your MDE account. You can only buy these bands during the party with a party wristband on your wrist. We will be there December 18. Do you think we will still be able to get a pin? It is one of the souvenirs my daughters want. I have the same concerns I’m coming December 9th am I out of luck for the magicbands? I don’t think people can buy them for me right? They will likely still have them, but someone could purchase for you, if you could find someone. I see these are limited in number, in your experience, do they usually last till mid December or do they get snapped up within the first few days they are offered?